I love a freshly mopped floor, especially if it’s my kitchen floor. I might be a tad old fashioned, but that one detail makes my house instantly feel brighter and tidier. 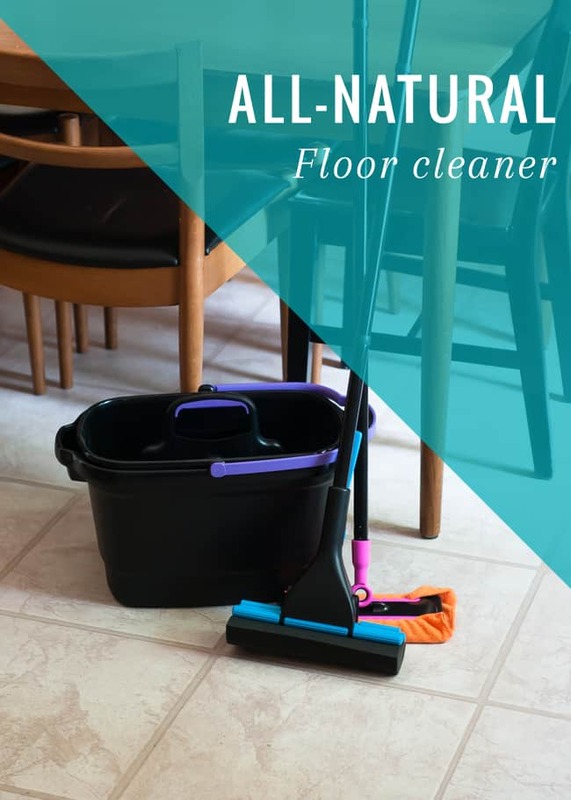 This all-purpose, all-natural floor cleaner recipe will leave your floors sparkling clean and your house smelling citrus fresh. I don’t mop nearly as often as I should, and inevitably five seconds after I finish up, a glass of something spills all over the floor. Such is life! Our kitchen floor gets heavy use so I mix up a batch of this all-natural floor cleaner recipe to whip it back into shape. This recipe is a classic! I’ve seen it all over the place, and for good reason: it works. For most jobs, even plain vinegar and water will do. Adding rubbing alcohol helps the floors dry faster. And both vinegar and alcohol help disinfect. Tea tree oil adds natural antimicrobial benefits, and orange oil makes my whole house smell fresh. I don’t normally add the dish soap unless my floor is extra sticky and/or greasy. 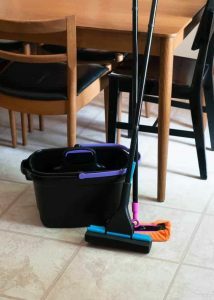 I tested this floor cleaner recipe out with the help of Casabella’s slick (in form and function!) Neon Ratchet Roller Mop and Neon 4 Gallon Bucket. 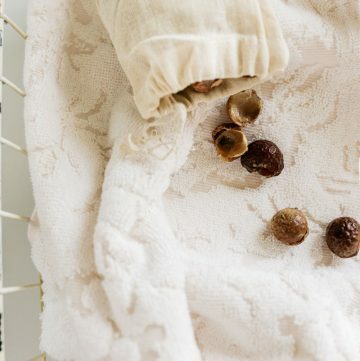 Mix up a batch of this all-natural floor cleaner for squeaky clean, disinfected floors. Combine all of the ingredients in a large bucket and use as needed. For tough jobs, use less water and add the dish soap, which will help cut tough grease. Disclosure: This post is sponsored by Casabella. All opinions expressed are 100% my own. I actually like to use citrus extract to remove lime, so it’s definitely my first choice to scrub the bathroom with. Great to know that I can clean my floor without using harsh chemicals, too! Beware the use of tea tree oil anywhere around cats. I would caution the use of it around any pets that lick their paws, but for cats it is toxic. 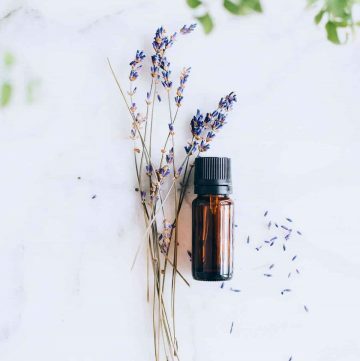 Animals are especially sensitive to essential oils and one must know what they are doing to prevent poisoning, If one has small children who crawl and put their hands in their mouths, that may be an issue, also. Just because things sound ‘natural’ do not assume that they cannot be detrimental to health, especially animals and small children as their systems are tiny compared to ours. I love the suggestion of rubbing alcohol! I will try that in my next mop bucket! Instead of Orange and tea tree, I use peppermint oil, and my whole house smells minty fresh, I love it! 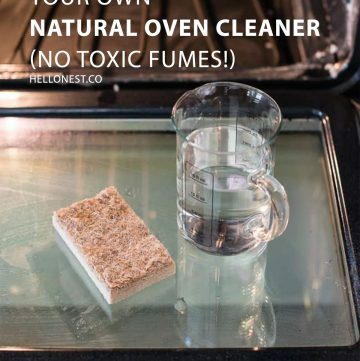 Do you have a DIY recipe that removes tough grease from kitchen appliances? I’ve tried a vinegar, water and baking soda mixture, but it just left a powdering film behind without removing the grease! Linh, great question! 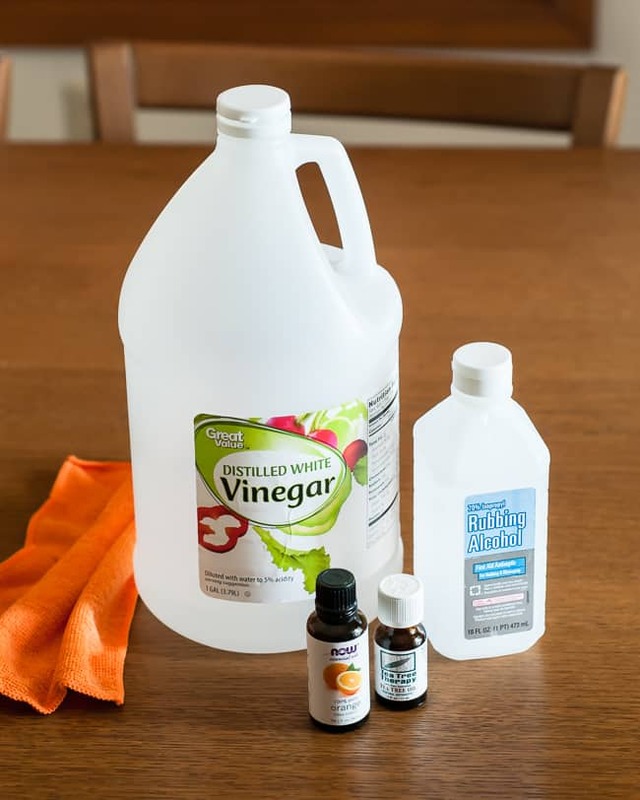 If you mix vinegar and baking soda together, it’s essentially the same as using water. You lost the benefit of both. 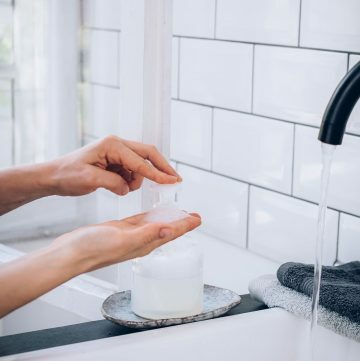 What I do is make a paste with a great grease-cutting dish soap (Dawn is fine, or a natural soap is great too – even castile soap works) and rub it on the stain, let it sit, then use a non-abrasive sponge to scrub off the toughest parts. That combined with a few wipe downs with a damp rag usually does the trick for me. I also do this for those filters on my stove hood. 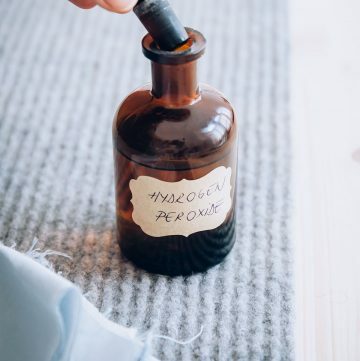 You can use plain old vinegar in a spray bottle, or add some alcohol, and spray that on to shine it up. I usually do that as a last step for my stove after I clean it. You can use mint if desired. Can this solution be used on wood floors…laminate and/or real? I’m not 100% sure about real wood floors – you may want to stick with an oil-based cleaner. It’s been awhile since I’ve had a real wood floor! But I used this same solution when I has a faux wood floor and it was fine. I have laminate now too and it’s still what I use. Works great! I have laminate “wood” floors and don’t add the alcohol to this solution. I’m afraid of ruining the color or finish on them. But the vinegar etc. does a beautiful job! I am trying to sign-up for give away and when I hit “hello good buys” it doesn’t go to anything that you can add your email or name. Can you suggest another way to sign-up? Can you make this up ahead of time and how long will it keep it’s effectiveness? I mop my home several times a week and making up this solution every time is a bit time consuming. Can I mix these ingredients into a spray bottle?